This is not your grandmother's whisk. Kuhn Rikon has reinvented the classic balloon whisk to create a colorful device that works great. It is an all-purpose whisk every kitchen should have. The high quality materials and superior design ensure that it will perform perfectly, and last for years. It features an upscale look and feel, with a brushed stainless steel handle and silicone coated wires. The coating on this whisk not only adds personality, it also makes it safe to use virtually anywhere. Rest assured that you will never scratch your non-stick cookware when you use this whisk. This high quality coating also makes this whisk incredibly easy to clean. Since food won't stick to it, you often just need to rinse under water to clean it. Don't worry though because it is totally dishwasher safe too. It is also heat resistant up to 450 degrees so you can feel confident using this whisk for any number of cooking tasks. It is the perfect size and shape for whipping cream, beating eggs and so much more. The convenient, built-in hanging hook ensures that your whisk will always be on hand when you need it. This little beauty also comes with a 10 year warranty so you know it is well built and will last! This is a balloon style whisk. It is best used for incorporating air into bowls of egg whites or cream. This means that it is the perfect tool for making meringues, souffles, cake batters, and whipped creams and more. You can also use it for mixing together dry ingredients too. When mixing flour, salt, baking soda etc. it helps to distribute and break apart larger chunks often eliminating the need for sifting. The Kuhn Rikon Silicone Rainbow Whisk has a round stainless steel handle that is comfortable to hold the entire time you're whipping up some cream by hand. It is great for use in nonstick cookware as the silicone coating won't tear Teflon. Dimensions 3.25" x 10" or 3" x 8"
Uses whipping, stirring, mixing, etc. 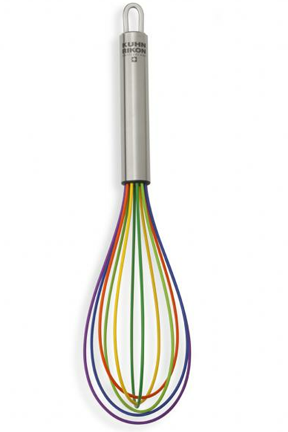 Silicone Rainbow Whisk by Kuhn Rikon - The classic balloon whisk reinvented. Colorful non-stick coating makes it fun to look at as well as completely safe for use with non-stick cookware. Order Yours Today.